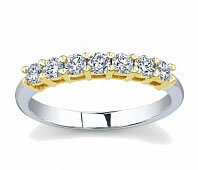 From time immemorial, diamond wedding bands have symbolized mutual love and matrimonial bliss. The unique charm and romantic appeal of a diamond wedding band has remained unmatched by any other piece of jewelry and a wedding is somewhat incomplete without the diamond rings. There has been a steady increase in the demand of diamond wedding and engagement rings and today there is one online store, Novori Jewelry, selling custom made, imaginatively crafted diamond bands and aesthetic solitaire rings. There is no denying that the brilliance of a diamond ring has a classy appeal and there can be hardly anyone who can resist the appeal of a diamond ring. 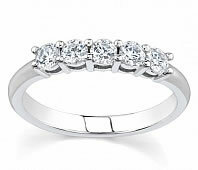 When shopping for diamond wedding bands you can opt for a matched set that compliment each other. Matched sets are available in simple bands, solitaire settings, mixed hues, flush set baguettes and many more. 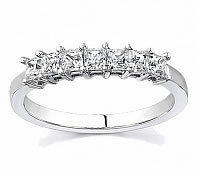 It may even be worthwhile to purchase the diamond wedding bands with the engagement rings together. Diamond wedding bands come in a plethora of designs – both traditional as well as trendy and the couple can select the design of their choice. Recent studies suggest that more and more brides favor diamond solitaire rings as they stand out and become the focus of all eyes on the special wedding day. The oft-quoted adage, ‘Diamonds are Forever’ is apt at the time of wedding as it is symbolic of the eternal love that death alone can part. Further, diamonds are tough, precious and indestructible and these qualities are associated with the undying love and deep bonding of the wedded couple. 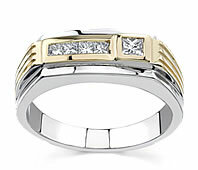 Diamond bands are also the most appropriate gifts during a wedding anniversary as it reaffirms the matrimonial bonds forged earlier. Commentators go to the extent of suggesting that the endless circular shape of the wedding bands signify an endless relationship. 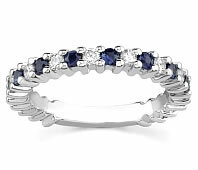 Further, it is stated that the wedding band is worn on the fourth finger which is supposedly connected to the heart of the wearer through a vein. These are just a few of the reasons why many young couples choose to mark the occasion with diamond rings even with some cost so that the wedding band will ever remain as a precious memory of the most important day of their lives and a constant reminder of their wedding promises. Fortunately the price of diamond engagement rings and wedding bands has come down significantly because of online jewelers like Novori Jewelry. Custom designed and made rings are now very affordable. Many couples deliberately opt for antique diamond wedding bands to add a classical touch to the occasion and to make heads turn. But today, there are also several trendy designs and some of them are breathtakingly beautiful. A diamond band is a ring that displays a complete circle of diamonds - but nonetheless, they come in affordable prices at Novori. If you are keen to have a wider choice, you can shop at Novori.com where you will find several hundred styles and varieties of diamond wedding and engagement rings. It is reported that diamond wedding bands will be cheaper when buying online because there is less overhead and greater savings included in the prices. When you buy diamond wedding rings, you should insist and obtain a certificate for the genuineness of the diamond. The certificate is a written document containing specific details about the diamond used in the wedding band or engagement rings – such as the shape, color, measurement, weight in carat, etc. All diamonds sold at Novori Jewelry are accompanied by the diamond grading certificate from an independent grading laboratory. Grading reports from an independent laboratory like GIA or EGL is important but some reports are better than others. For more details on the reports, give us a call at 1-877-877-4141. After all, diamond wedding bands are a great investment and you should be satisfied with the authenticity and quality of the diamond.